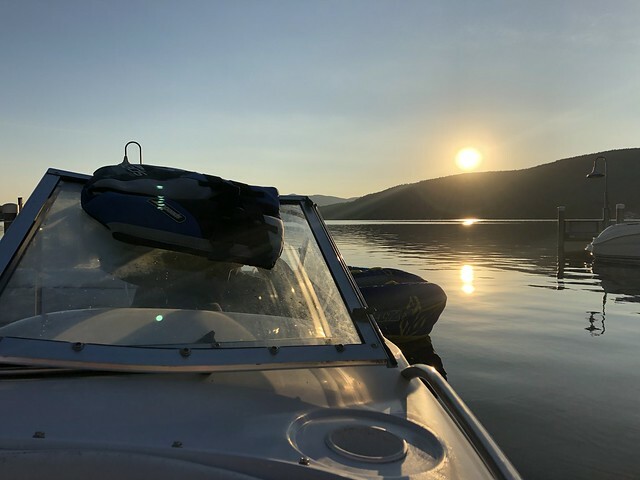 Finally got the nerve to take my 98 up to Lake George NY for a long weekend of annual camping trip....what a beautiful lake! I am wondering about a different prop...and honestly don't know whats on the boat now but at WOT its only about 3300 rpm speed around 35-38 depending how much I can trim it. Any easy way to check if its a throttle rigging issue or simple as a prop? It works great around my lake for water sports just seemed like for long runs across a big lake maybe something different is in order. Was an eye opener to compare our boat to our friends with us who had a 21 foot hurricane, their boat much more comfortable floor plan/storage wise, but in choppy water the Four Winns was much better cutting through where the hurricane would slap and jar along the top of the waves. It also took forever to get on plane and had a slight edge in top speed (V8 merc opposed to my 4.3 VP) I used 10 less gallons of gas and we stuck together most of the days. All in all a good experience, not much I would change and will be doing it again next year. Before doing anything else....try removing that "whale tail" from your outdrive. It should be held on by a few bolts, but those create a lot of drag. If you give that a try - let us know how much improvement you get on top end. That thing really causes drag when you start trimming up. I also imagine you will see better fuel economy with that thing off. If you decide to remove and want to leave it off - i would get some tight fitting rubber plugs to fill the holes they drilled in your drive to install that thing. I wouldn't want constant water forced through those little holes creating added corrosion. From my experience the only thing you gain with the "whale tail" is you get up on plane quicker with the unit all the way down and can stay on plane better at lower speeds, which helps in towing for water sports. Other than that it is working against you not to mention it adds to the stress on the drive unit in my opinion. If help is needed for planing with your load the best option is trim tabs - more pricey but you get what ya pay for. Second issue I would look at after removing that hunk of plastic from the drive is what your WOT rpm is....you may check your manual but i believe it should be around 4400 to 4800ish....it could be someone swapped the prop. If so, i would go back with the manufacturer recommended prop pitch if not the pitch equivalent in the 4 blade style. yea I have used it for 6 years with that on, removed it for a few days last season and it acted much more squirrelly in turns.....will try it again with a more critical eye shortly.... The data plate on the motor is in fact 4400 at WOT. Hadn't considered the drive mod effecting that much but possible I suppose. Will not be going the trim tab route. 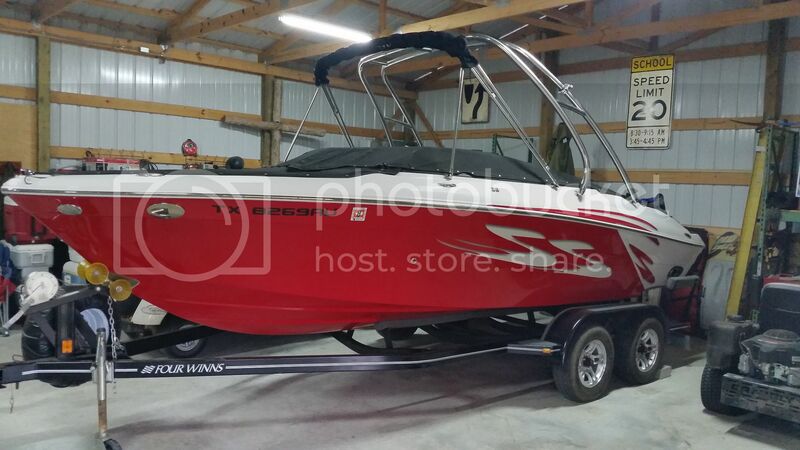 Below are specs for your boat from Four Winns. Agree with removing fin on drive & go from there but would guess you need to go down in pitch to the next size. 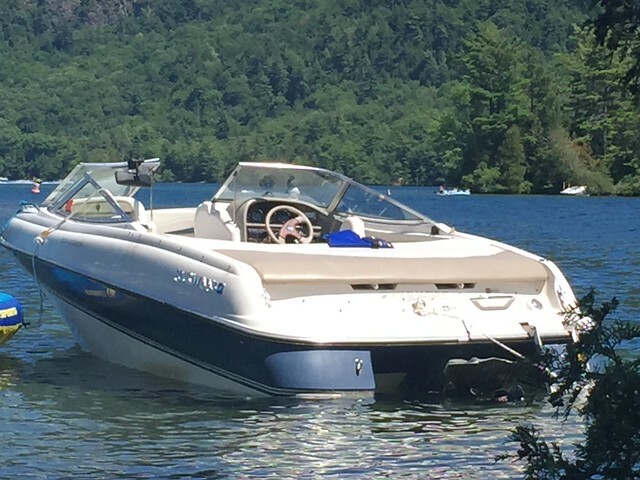 2002 268 Vista 5.7 GXI "Livin' the Dream"
1996 Rinker 192 Captiva. "The Simple Life"
1999 Yamaha XLL 1200 Waverunner. Where'd you launch, million dollar beach? Sounds like you had a blast. 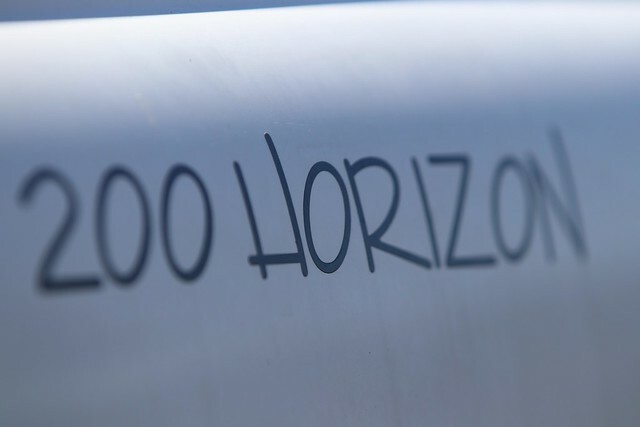 I want to take my H200 there as well and will be launching at $ 1,000,000. Did they sell the use permits at the boat launch? In chop, did you just hold the throttle at the same position, or do some throttle work? It helps to go 45 degrees into the chop, and let off when going into the peak of the wave. Then get back on the gas. It takes some practice to get the feel of it. If all else fails, just slow down. Your passengers will thank you, lol. "Will not be going the trim tab route"
I hear ya...me neither. Just thought i would throw that out there but not worth the money for what i use my boat for. Would be different if i had a larger boat, but i just throw a cookie to the side of the boat i want lowered and the heavy folk go for it. Don't think the tale will change the rpm, but will slow ya down when trimmed up. I believe if ya pull the prop it will have the pitch stamped inside. It is on my prop anyway, just can't remember what it is. Hey OP, where did you park your truck and trailer? Does million dollar beach allow overnight parking? I plan on doing some island camping for a few days this summer and am wondering where to launch and park my rig. We're staying on the southern island and will plan on launching at Dunham's Bay. They do the inspection and sell the permits there as well. Also not sure if you fixed your low RPM/speed issue but I believe your boat has those stupid flaps in the exhaust that break off and clog the pipe. I'd look into that because your symptoms sound similar. My original boat was a FW 19 foot Horizon. 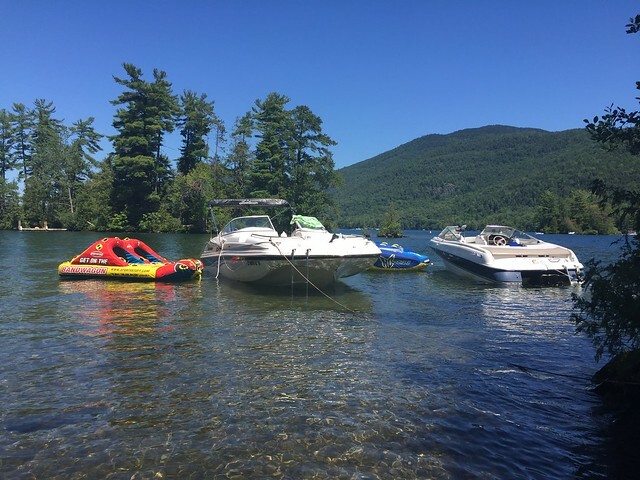 I quickly outgrew that because I want to be able to do Lake Winnipausakee in NH. Very similar to Lake George as far as waves, cho length and depth. My FW Sundowner 245 was more than adequate to deal with most of it. Not sure I would have attempted going across the broads on anything but the calmest of days although many people do! 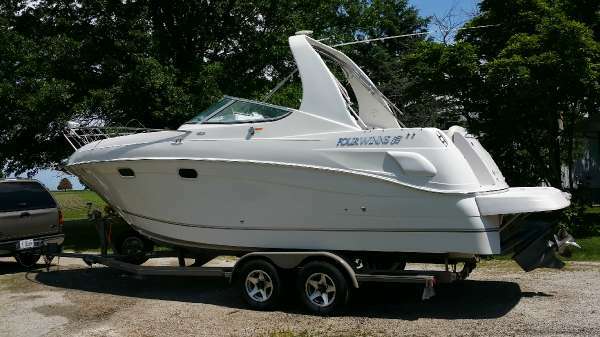 My next boat will be a 2012+ S215 once they come down in price, lol. My 19 was a 1997 with 4.3l Volvo Penta. It was a great first boat! Jon, this is kind of a late response, but I thought I'd lob out some observations from the cheap seats. You say that the boat's top speed is 35-38 mph at 3300 rpm. Looking at the chart captkevin posted, it appears that you are getting more speed at a lower rpm than the chart shows. This would indicate a prop with more pitch than original, maybe significantly more pitch. Generally, 2 more inches of pitch will reduce engine speed at top end by 300-400 rpm. This will also make the boat slower to plane and the engine will be "lugging" more (kinda like driving a car in high gear at low speed). Another possibility is that the outdrive was changed to one with a different gear ratio. There should be a tag on the left side of the outdrive showing the gear ratio. 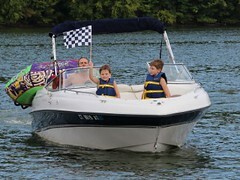 I belive the gear ratio should be available on the Four Winns website or in your boat's paperwork. I'd check the prop for pitch numbers, usually on the side or back of the hub. The gages in boats can be significantly inaccurate. I would recommend verifying your speedometer with a GPS and verifying your tachometer accuracy with another instrument. I bought a timing light (maybe $80-100) with a digital readout for rpm, voltage, etc. to check the tach and for general maintenance. If the gages are accurate, you might do a compression check and tune up if needed. My '95 190 Horizon (5.0 Ford EFI) had a power loss issue due to an exhaust flapper valve that came loose and mostly blocked the exhaust flow. That caused a loss of 600-700 rpm and 12-14 mph at top end. You might check yours, if your boat has them. The flappers were discontinued in the late '90s, but your '97 probably would have had them when new. You should be able to see whether the throttle is opening fully by removing the spark arrestor and looking in the top of the carburetor. Surface Interval: A scuba diving term for that time between dives to relax and prepare for life's next great adventure.